Finally, FINALLY, it looks like spring has decided to put in an appearance. Better late than never and all that. And it’s the perfect time of year to have a little seasonal decor refresh. Coming back from holiday was ridiculously hard but thankfully the lovely team at Christy Home came up trumps to soothe my post-holiday blues. They’ve kindly sent me one of their beautiful new luxury Haruki bedding sets and I’m in spring blossom heaven. Growing up, my parents never updated soft furnishings based on the seasons so it was never on my radar particularly. Then of course something like Instagram comes along and it’s easy to disappear down a rabbit hole of new cushions/prints/ornaments/candles. I realised that’s ok though, updating my home on a small scale without having to go down a dramatic redecoration route. The Christy Home bedding comes in three different colourways – pink, which is my choice for our bedroom decor; ochre and coral. It features the prettiest Japanese blossom and moutain scenery, giving a contemporary Oriental feel which is just perfect for this time of year. Plus, it’s decadent all the way, made with 200 thread count digitally printed on a beautiful cotton sateen fabric. 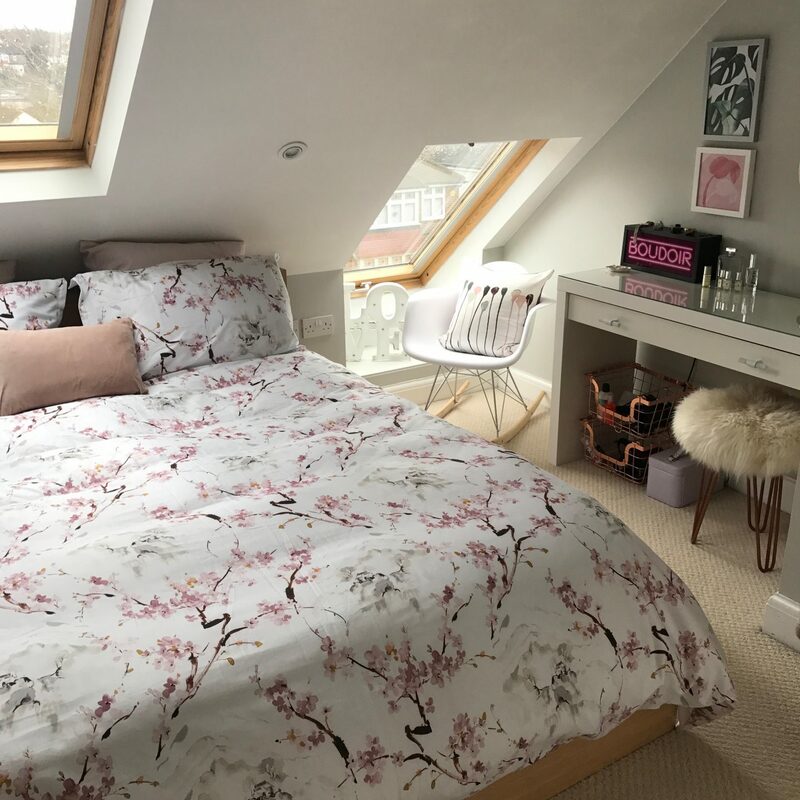 There’s so much we still want to do to our bedroom which as you can probably tell is the loft conversion part of our home. The previous owners completed the conversion but it’s not the most practical use of space. That said, giving it a lick of paint and adding a couple of new furniture bits and bobs means it looks so much better than when we moved in. If you’d like some bedding of your own, prices start at £70 for a single bedding set up to £120 for the super king. We chose a king which comes with two pillowcases and then I paired it up with blush pink mattress sheet and bottom pillow cases and now I basically dive into bed. Well, when it looks this pretty who wouldn’t? Thank you so much to Christy Home for kindly providing the bed linen set free of charge. I am under no obligation to include a review on the blog but absolutely love it and want to share the joy! Oh WOW! 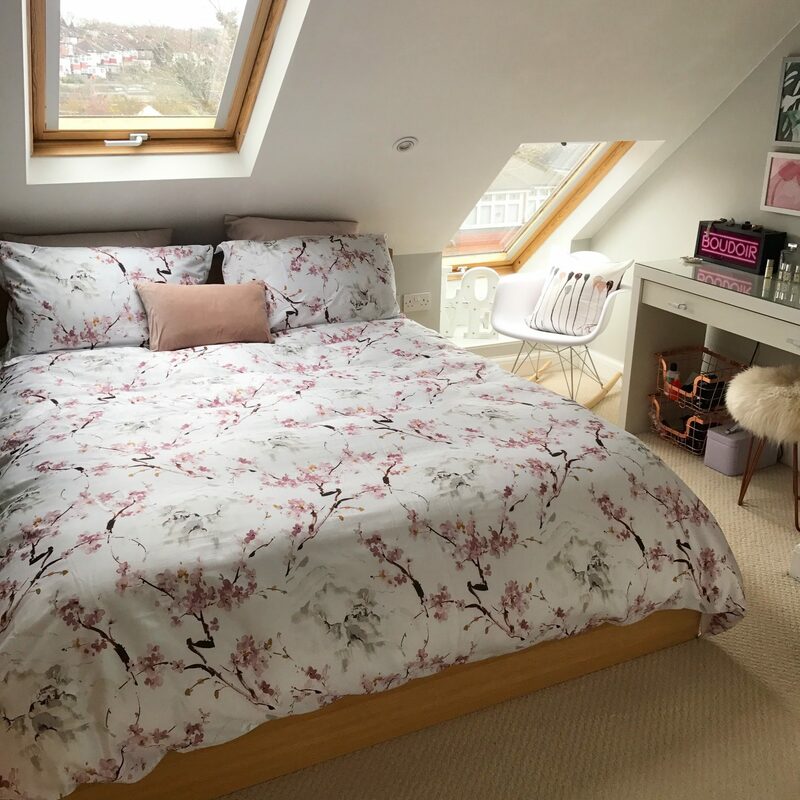 I almost bought wallpaper for our living room in a similar pattern to your bedding but decided against it and have actually painted it the same colour as you have on your wall (give or take a shade) There’s something about the Japanese blossom design isn’t there? So fresh! It looks beautiful! Wow that bedding is gorgeous Lins! It matches your bedroom decor perfectly . Also i want to jump in there myself! haha!